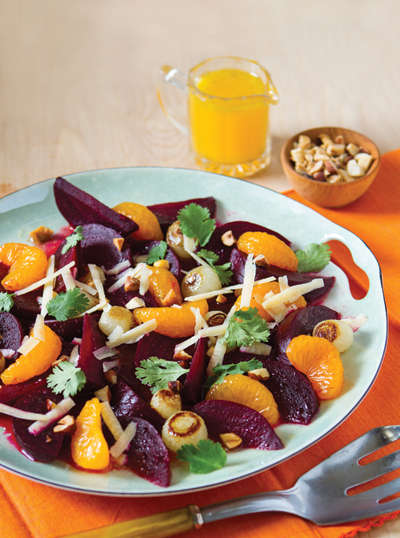 Juicy beets are at the root of this sensational fall salad. Beets: They’re just as rich in flavor as they are in color. Roast ’em and toss ’em with zesty oranges, savory onions and crunchy hazelnuts, and the nutrient-heavy root takes center stage in a light yet hearty salad. So if you’re searching for a colorful creation to serve at your next fall fête, look no further than this unbeatably simple recipe to satisfy even the most gourmet palates. Cut the stems and tails off the beets. Do not peel. Line the bottom of a baking pan with foil. Place the beets in the pan and toss them with half of the olive oil, salt and pepper. Roast for 25 minutes. Trim both ends off the pearl onions. Then toss them with remaining olive oil and salt and pepper. Add pearl onions to the beets and roast an additional 15 minutes until beets and onions are tender. Peel and remove the membranes from the oranges with a sharp paring knife. Cut the oranges in half lengthwise and then crosswise into thin slices. Seed the slices, if necessary. Peel and quarter the beets. Lay the beets on a large platter. Top the beets with the orange pieces. Scatter the roasted onions around the beats. In a medium bowl, combine the hazelnut oil, coriander and orange juice. Whisk until well-combined and season with salt and pepper. Drizzle the dressing on top and sprinkle with coriander, toasted hazelnuts and grated cheese.